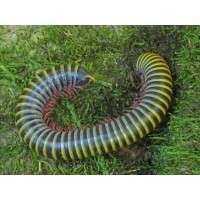 I am the original 'Bug Lady', breeding and supplying many types of creepy crawly pets. My little home-business has now been going for well over 35 years, in the last few years I have found myself being called the ‘Spider Lady’ more often than not. Trends are continually changing and arachnids are far more popular than they have ever been before. I have a bug room at the side of our house that is dedicated to keeping a multitude of creatures. Since moving out of London in 2003, my work is mainly postal but I do welcome visitors by appointment (see Ginny’s Jungle section for details). It took me some time to actually reach the 21st century and see the potential of customers ordering online. I am now fully convinced, business has increased tremendously since setting up my first online store in 2009. In October 2012 my online store went live, the photographs were larger and clearer, the information more comprehensive and the online ordering simpler and therefore easier to use. In September 2015 my online store was completely revamped to make it more compatible with ordering on a mobile device such as phone or tablet. The website is now far easier to navigate on a smaller screen and the clarity of the photographs is yet again improved. Early in 2015 I finally became acquainted with the wonders of Facebook and I now post the latest information and photographs on a regular basis. I am still readily accessible by email and telephone and I strive to maintain my position as the most friendly and reliable bug supplier! In years gone by I have bred Lepidoptera for schools and private individuals, I manufactured a range of net cages and visited primary schools with my mini-beast show. I now concentrate on breeding and supplying live bugs within the UK and Europe. I appeared on television quite frequently in the past (the Big Breakfast and various children's TV shows), these days I am generally behind the scenes, supplying the bugs to be filmed. I provide many schools, universities, butterfly farms, zoos and private individuals with an ever increasing, number of invertebrate animals. I am mainly a livestock supplier but I do sell a few pieces of associated equipment e.g. heat mats, plastic containers, thermometers and hygrometers. All my parcels are sent by Royal Mail's fastest methods of delivery, which is calculated on weight. I therefore only sell 'lighter' items of equipment these day. As you can tell from just a couple of paragraphs the bug business is ever changing and l do my best to adapt, trading for over 35 years isn't bad going! I do not import any animals, consequently the vast majority of my creatures are captive bred. In 2016 I started Ginny’s Jungle parties and Animal Encounters and in March 2018 I began to amalgamate the two businesses onto the one website (as I write this it is still very much a work in progress). I have lots of ideas but not a lot of time! However, my daughter is helping with the parties and also helping to manage my social media around her job and studies.